Salter, G. (2013) Information Marketing Goes Mobile: Reaching Global Audiences to Generate Leads and Sales Using Mobile Content, Keynote Presentation, World Brand Congress, Mumbai. Salter, G. (2013) Mobile Learning and Global Marketplaces. MobiLearnAsia , Singapore. Salter, G. (2013) Designing Educational Apps. MobiLearnAsia , Singapore. Salter, G. (2011) Designing User Interfaces for iPhone and iPad Apps. Apple Dev World Conference, Melbourne. Salter, G. (2010) iPhone Application Development for the Terrified, Apple Create World Conference, Brisbane. Salter, G. (2010) Developing Native and Web Applications for Educational Content Delivery in Higher Education. Apple X-World Conference, Sydney. Ali, S., & Salter, G. (2004). The Use of Templates to Manage On-line Discussion Forums. Electronic Journal of eLearning. 2(1), 11-18. Salter, G. (2003). Comparing online and traditional teaching – a different approach. Campus Wide Information Systems. 20(4), 137-145. Hansen, S., & Salter, G. (2001). The Adoption and Diffusion of Web Technologies into Mainstream Teaching. Journal of Interactive Learning Research. 12 (2/3), 281-299. Salter, G. (2000). Making use of online discussion groups. Australian Educational Computing, 15 (2), 5-10. Salter, G. (1993). Computer Education or People Education? Australian Educational Computing, 8, 231-234. Barry, R., & Salter, G. (1991). Autonomic Changes in a Serial Learning Task. International Journal of Psychophysiology, 11(1). Salter, G. (2008). Voluntary Participation in Online Tutorials: If I Build It, Will They Come, World Conference on E-Learning in Corporate3, Government, Healthcare, & Higher Education, Las Vegas, Nevada. Aouf, R., Hanson, S., & Salter, G. (2004). Incorporation of Signage Information with Multimedia Data Processing by Making Use of XML Technology. International Conference on Computers in Education, Melbourne. Hathaway, M., Hansen, S., & Salter, G. (2004). The Importance of Using a Unified Model to Define Adaptive Learning Environments. Computers and Advanced Technology in Education, Kauai, Hawaii. Salter, G. (2004). Stages of Concern and the Need for Participatory Design in the Development of Online Learning Activities. International Conference on Computers in Education, Melbourne. Salter, G., & Filipovic, M. (2004). Educational Applications for Mobile Devices, International Conference on Computers in Education, Melbourne. Salter, G., & Stratti, H. (2004). Multiple Representations of Content in Web-Based Learning. The IASTED International Conference on Web-Based Education, Innsbruck, Austria. Salter, G. (2003). Encouraging Participation in Voluntary Online Staff Development. World Conference on E-Learning in Corporate, Government, Healthcare & Higher Education, Phoenix, Arizona. Ali, S., & Salter, G. (2003). Structured Online Discussion in Higher Education. 2nd European Conference on e-Learning. Glasgow, Scotland. Salter, G. (2002). Strategies for the use of synchronous computer-mediated communication in education, International Conference on Computers in Education, Auckland, New Zealand. Hansen, S., & Salter, G. (2001). The take up of web technology. Promoting changes in teaching staff and in the institution. ASET-HERDSA Conference, Toowoomba, Queensland. Salter, G. (2001). Using technology to help cater for large practical classes in computing. International Online Conference on Teaching Online in Higher Education. Salter, G., Nanlohy, P., & Hansen, S. (2001). Online Discussion Groups: Strategies to Enhance Participation and Collaboration. ASET-HERDSA Conference, Toowoomba, Queensland. Salter, G., & Hansen, S. (2001). Facilitating Web-based Staff Development in Higher Education. ASET-HERDSA Conference, Toowoomba, Queensland. Salter, G. (2000). Facilitating Learning: Students as Teachers in Online Environments. International Online Conference on Teaching Online in Higher Education. Salter, G. (2000). Developing Skills in Online Teaching: The Web as a Constructivist Medium for Staff Development. IEEE International Workshop on Advanced Learning Technologies, Palmerston North, New Zealand. Salter, G. (2000). 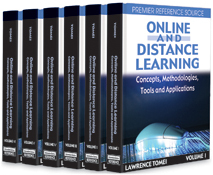 Modelling a Constructivist Approach to Online Learning. International e-Workshop: Developing On-Line Tutors. Salter, G., Hansen, S., & Davies, P. (1999). Increasing the Adoption of Online Teaching by Modelling Good Practice. Proceedings of WebNet 99 World Conference on the WWW and Internet, Honolulu, Hawaii. Salter, G., & Hansen, S. (1999). User-Centered Design for the Facilitation of Web-Based Teaching. Proceedings of the Teaching & Learning Conference NTU (pp. 231-236), Darwin, Northern Territory. Salter, G., & Hansen, S. (1999). Modelling New Skills for Online Teaching. Proceedings of the 16 th Annual Conference of the Australasian Society for Computers in Learning in Tertiary Education, Perth, Western Australia. Hansen, S., Salter, G., & Davies, P. (1999). The Take-Up of Web Technology:-Adoption & Diffusion into Mainstream Teaching. Proceedings of WebNet 99 World Conference on the WWW and Internet, Honolulu, Hawaii. Davies, P., Hansen, S., Salter, G., & Simpson, K. (1999). Online Assessment with Large Classes:-Issues,Methodologies and Case Studies. Proceedings of WebNet 99 World Conference on the WWW and Internet, Honolulu, Hawaii. Salter, G. (1996). Factors Affecting the Introduction of Open Learning Systems in Higher Education. Proceedings of the Australian Computers in Education Conference. Johnston Mark., Salter Graeme, Donegan Kevin, & Davies Paul. (1996). Multimedia at UWS Macarthur - an Experiment. Proceedings of the 13th Annual Conference of the Australian Society for Computers in Learning in Tertiary Education. Salter, G. (1995). Quantitative Analysis of Multimedia Audit Trails. Proceedings of the 12th Annual Conference of the Australian Society for Computers in Learning in Tertiary Education. Salter, G. (1994). Physiological Feedback in Computer Based Learning. Proceedings of the Asia Pacific Information Technology in Training and Education Conference. Barry, R., Wortmann, L., & Salter, G. (1992). Correction of SingleTrial Cardiac Activity for Respiratory Sinus Arrhythmia. 6th International Congress of Psychophysiology. Salter, G., & Barry, R. (1991). Serial Learning Tasks and the Orienting Response. Proceedings of the ThirtyFirst Annual Meeting of the Society for Psychophysiological Research. Salter, G. (1990). Towards a Competent Computer User. World Conference on Computers in Education. Barry, R., & Salter, G. (1990). Autonomic Changes in a Serial Learning Task. 5th International Congress of Psychophysiology. Salter, G. (2012). Cross-Platform App Development – Going Native the Easy Eay. MobiLearnAsia, Singapore. Salter, G. (2005). The use of problem-based learning in medical education, Health Informatics Research Group, UWS. Salter, G. (2005). Maximising web traffic and sales for SMEs, AeIMS Research Group, UWS. Salter, G. (2004). Problem-Based Learning at the Republic Polytechnic in Singapore, Re-learn Research Group, UWS. Salter, G. (2004). A Constructivist Approach to Online Learning: Encouraging Pedagogical Re-engineering. Post-doctoral seminar, Charles Darwin University. Salter, G. (2000). Workshop on Web Based Environments for Delivery of Education, University of Columbo, Sri Lanka. Salter, G. (1996). Technology in Teaching, Presentation for Chancellor and Deputy Vice Chancellor, University of Western Sydney. Salter, G. (1996). Analysing multimedia audit trails, Research seminar series New Technologies in Teaching and Learning (NeTTL), University of Sydney. Salter, G. (2002). Claims for Online Teaching: Separating the Real from the Virtual. SCIT Strategic Planning Retreat. Salter, G. (1993). Attentional Effects in Learning from Computer Assisted Instruction. Research Abstracts, University of Wollongong. Salter, G., & McRae, D. (1992). CALS from Paper Intensive to Integrated Electronic Information Environments. Proceedings of the 9th Annual Conference of the Australian Society for Computers in Learning in Tertiary Education. Salter, G. (1990). The Perils of Teaching Computer Applications. ASCILITE Newsletter, 4(1). Salter, G. (1989). Psychological Bases of Instruction. Proceedings of the 7th Annual Conference of the Australian Society for Computers in Learning in Tertiary Education. Salter, G. (1988). Evaluation A Neglected Step? Proceedings of the 6th Annual Conference of the Australian Society for Computers in Learning in Tertiary Education. Salter, G. (1985). Computers in School Administration. Computer Education News. Salter, G. (2017). Creating Engaging and Effective Presentations. Professional Staff Conference, Western Sydney University. Salter, G. (1999). Effective Online Teaching. Transforming Education for a New Era Conference. Salter, G. (1998). The Use and Abuse of Computers in Education. Scholarly Conference for Christian Educators. Salter, G. (1995). Access, ASCILITE & other matters. UWS Educational Technology Conference. Salter, G. (1994). Aspects of CAL at Macarthur. UWS Teaching and Learning with Technology Conference. Tremayne, P., Salter, G., & Russell-Bowie, D. (1993). Performance Enhancement and Biofeedback. International Fitness & Healthy Lifestyle Convention. Tremayne, P., Salter, G., & Russell-Bowie, D. (1993). Cardiac Biofeedback and Performance Anxiety: A Case Study. 19th ACHPER Biennial Conference.